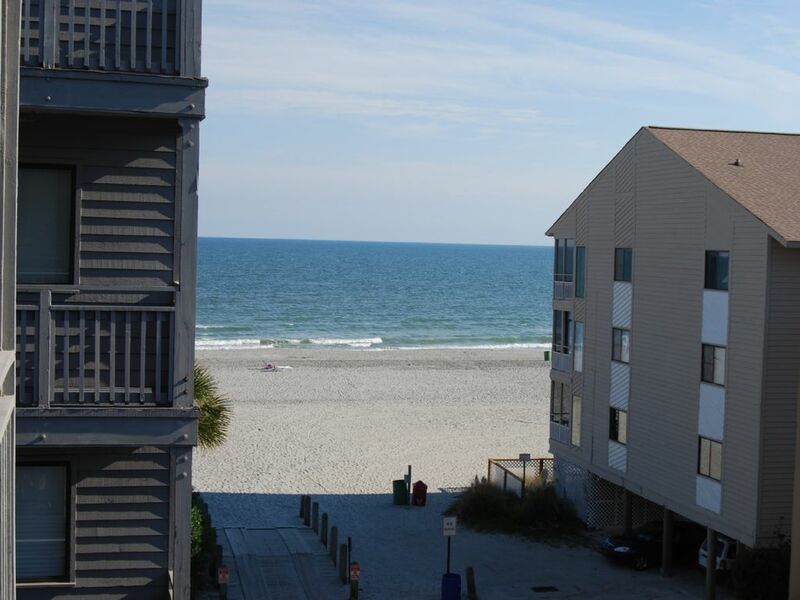 Discover Myrtle Beach from this well-appointed condo in the family location at Pelican’s Landing on Shore Drive. Enjoy breathtaking views of the picture-perfect Grand Strand beach from the living room screened balcony or the master suite balcony of this immaculate, third floor, ocean side condo. You are so close to the ocean that you can open the master suite balcony door and fall asleep to the sounds of the ocean in the background. Take the elevator down from the condo and there are no roads to cross to have your toes in the warm South Carolina sand. Sorry but HOA rules specify No Pets, Trailers, Boats, Campers, Motorcycles and Minimum age to rent is 25 yrs old. - Ocean Annie’s bar which features nightly live music in the peak season. * Beach View: Corner unit on oceanside, no streets to cross to be on the beach. Many oceanside units don't have any view. This unit being on the front corner has a full ocean view. * Ocean View: Corner unit on oceanside, no streets to cross to be on the beach. Many oceanside units don't have any view. This unit being on the front corner has a full ocean view. * WiFi (Wireless Internet): Free high speed wireless internet. * No Pets Allowed: HOA rules, sorry! * Kid Friendly: Great family location and complex includes full play structure, 2 pools and putting green. * Minimum Age Limit for Renters: Age 25, sorry HOA rules. * Smoking Allowed: On balconies with doors closed only. * Smoking Not Allowed: No smoking inside the unit. We stayed in Pelican's Landing for the first time years ago for a family reunion and everyone in our extended family has not stopped going ever since. This quiet location allows you to enjoy your vacation with your family and friends and not the 1000's of other vacationers in the more touristy high rise areas while still being centrally located and within a mile or two of all the major tourist attractions. Being on the ocean side having no streets to cross is a definite advantage. No need to worry about kids running into the street as they get excited about the ocean. Open the balcony door and fall asleep to the sound of the ocean in the master suite. Corner unit on oceanside, no streets to cross to be on the beach. Many oceanside units don't have any view. This unit being on the front corner has a great ocean view. Take the elevator down, walk 20 ft and you're in the sand. Comforters, blankets, and pillows provided. Bed sheets, bath towels, and kitchen towels NOT included, but can be provided for a nominal charge. Full size private washer in unit. Full size private dryer in unit. Garage and uncovered parking available. Equipped with sleeper sofa, recliner, 2 side wicker chairs, cable TV, DVD, VCR, Stereo, Nintendo Playstation and games. Coffee and coffee filters supplied, please just replace items you use and finish. Salt, pepper, other spices, napkins, paper towels, plastic wrap, baggies, dishwasher liquid, laundry detergent, trash bags, all the basics, we just ask that you replace anything you finish. Cable TV in living area and all bedrooms. In living room, master bedroom and room with 2 twins. Varied assortment, feel free to take one or leave one. TONs of beach toys, varied boogie/body boards, noodles, etc. In living room and master bedroom (Pac Man joystick with retro games). Oceanview balconies, screen balcony off living area and second balcony off master suite. Screen porch off living room with patio table and chairs. Balcony off master with 2 adirondack chairs. One screened porch, one open porch. Various boogie boards and body boards always in the laundry room. On balconies with doors closed only. 2 pools on property, only to be used by condo guests, not open to general public. 2 outdoor pools in complex, one directly in front of ocean and one (heated spring break and late September) across the street by children's play area. Amazing condo with amazing owners. Visiting Myrtle Beach was a last minute decision but we LOVED it. Our room was just a short walk from the ocean and we had everything we needed. The property manager was great and very helpful. I wish we could have stayed longer but we will definitely be going back! Wonderful place for a family , has absolutely everything you might need. Great communication from the owner. Very conveniently located from the grocery stores, restaurants, shopping. Second time here, and hope to be back! We love staying at 307 Pelicans Landing! It is a beautiful ocean view condo - close to so many attractions - very family friendly and has everything you need! We will be back! The property was nice and accommodating. I even forgot to rent the linens until the week before and Melissa made it happen!! We were very happy with our stay.